Today I found out why a hamburger is called hamburger. In the early 18th century some Germans noticed during their travels to Asia, that the locals would stuff their beef between their saddles while they would ride, to help soften it for later consumption. The Germans loved the idea of soft seasoned meat, and so they brought the idea back home with them to Hamburg. As time went on, it soon became known as Hamburg Meat. A few years later, as German immigrants made their way to the U.S., they shared the recipe for Hamburg Meat. The first record of Hamburg meat in the United States was in 1884, when the Boston Evening Journal mentioned “Hamburg Steak.” It wasn’t long before people began to put their own spin on things. The first known “Hamburger” was made by Charlie Nagreen. He introduced his “American Hamburger” at the Outgamie County Fair in Seymour, Wisconsin in 1885. His “hamburger” though wasn’t on a bun and was of course without cheese or bacon. Oh, if he only knew what he was missing. I guess like most great things in history, it just took time to develop. The first known Hamburger on buns as we know it today, took place in St. Louis in the 1904 World Fair. In 1921 Walt Anderson, a cook from Wichita, Kansas convinced Billy Ingram to invest $700 to help him start the first Hamburger restaurant chain- The White Castle Hamburger chain. 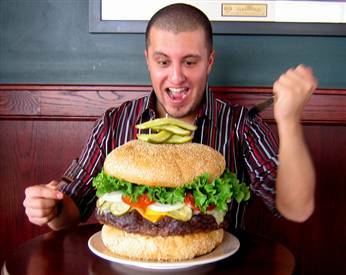 The biggest hamburger ever served weighed 8,266 lbs. It was cooked in 2001 at the Burger Fest in Seymour, Wisconsin. To clarify the name, it would better avoid any confusion by saying, ” Because the Germans loved the idea of seasoned meat, on their return home they brought it with them to (the city of) Hamburg”. Actually it’s because the breed of cows they used was a Hamburg cow.